Anyone who brings home this book will be in big trouble. 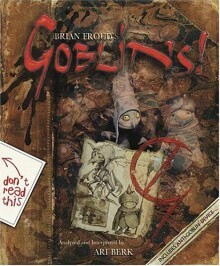 Renowned artist Brian Froud and scholar Ari Berk have conducted a thorough investigation into the goblin realm. (For the uninformed, goblins, a subspecies of faery, are those maleficent creatures that cause all manner of havoc in the human realm.) The fruit of their labor, however, turned out to be a rotten apple: the book is infected with goblins. Now, thanks largely to Froud and Berk's continuing carelessness, the noxious, viscid, and largely nonsensical volume has been unleashed on an unsuspecting public. Among its pages are reproductions of the ancient, odoriferous Codex Goblinensis; a glossary of common goblins and their markings; and a gazetteer of goblin photographs taken with the arcane Goblin Camera. Those fearing an infestation can refer to the section detailing how to determine if you've "got goblins" and, if so, what you can do about it. (There is nothing you can do about it. )Combining the folkloric approach of Faeries with the utter wackiness of Lady Cottington, this is the team's most visually rich and outrageous opus yet. Basically, it's a kids book for kids with quite vague imaginations. The information was fairly insipid, and most of it was pretty whacky stuff your kid might like after some smarties, but the drawings were what I got the book for. I could look at goblins all day.